All about chickens - Welcome to Jolly Egg Farm! Welcome to Jolly Egg Farm! Chickens were originally wild jungle birds from Asia! Although generations of selective breeding have since created a domesticated variety of bird (gallus gallus domesticus) that can lay 300 eggs a year, chickens still retain some of their jungle instincts. As such, they like to have cover over their heads and they like to live in groups, keeping on the watch for danger and nestling together to sleep. 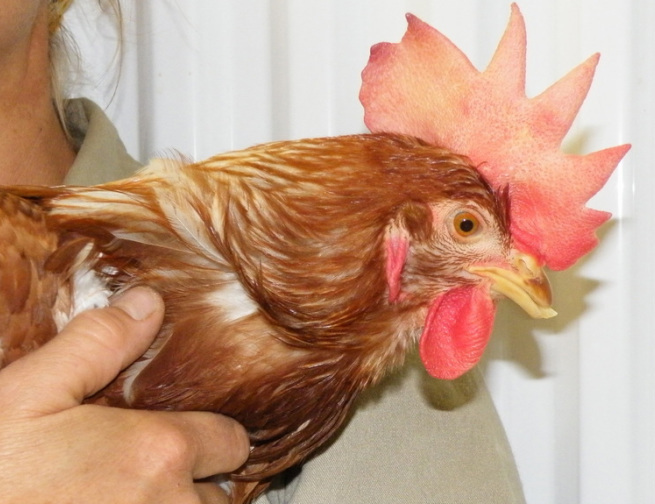 ISA Browns have creamy and rusty red feathers and lay eggs with brown shells. This is our third flock at Jolly, slightly less than 9000 birds! The birds come in as six month old pullets in late fall and spend 12 months laying for us. After this time, efficiency drops rapidly. The flock is sent out for processing for food, and we clean and sterilize the barn, which then stands empty for two weeks before the next group arrives. The Jolly chickens are kept in cages containing six to seven birds. They have free access to food and water at all times; fresh grain rolls right along their feed troughs five times a day! The barn is very well ventilated and the temperature is computer controlled for the birds' maximum comfort. We walk through the barn at least six times a day - often much more frequently - checking on conditions and looking for any problems. The health and contentment of our chickens is of paramount importance to us at Jolly Egg. We are happy when they are happy!